Juliet, a 15-year-old Christian girl in Nigeria, was orphaned recently when her parents were killed for their Christian faith. Christian persecution is rising particularly in China, India, and Nigeria, according to Release International, a British charity which has followed this trend for 50 years. The context of the persecution differs by region. The attackers range from militant Islam in Nigeria, Communism in China and militant Hinduism in India. The massacre of 50 innocent Muslims in Christchurch, New Zealand shocked the world recently. However, more than 120 Christians were gunned down or killed with machetes over the past three weeks by Muslims. Did you "see that reported in mainstream media?" asks David Virtue, a Christian commentator. Twelve 12 Christian villages were wiped out by Fulani tribesmen, resulting in 200 Christians dead. In the Philippines, Muslims bombed a Roman Catholic cathedral, killing 20 people and wounding dozens more. Virtue reports that to date in 2019, there have been 453 Muslim attacks in which 1,956 people have been murdered. In 2018, a total of 4,305 Christians were murdered by Muslim attacks across the world. If the 2019 pace continues, 12,000 Christians will be killed this year - nearly three times the deaths of 2018! But if a Jew or a Muslim or a black is killed by a white nationalist, it is breaking news on TV and across the world. In Nigeria, Fulani militants killed up to 6,000 Christians in north and central Nigeria in the first six months of 2018 and drove 50,000 from their homes (numbers calculated by Release International, which differ somewhat from numbers quoted above.) Fulani militants, who are Muslim herdsmen, are attacking Christian villages in the north of the country. "The tactics they are using appear to be well coordinated and planned," asserted Andrew Boyd, a spokesman for Release International. He believes that they are a "much more serious menace than Boko Haran," which has gotten more visibility for its killings. One tactic the Fulani employed was to fire shots at night and then lie in wait with machetes for men, women and children who emerge from their homes. In India Christian persecution is sparked by Hindu nationalists who are on the rise. They see no place for Muslims or Christians in India - and have become emboldened since 2014 when the government of India Prime Minister Narendra Modi assumed power. There has been a rise of attacks on pastors and prayer meetings. Why? The governments of several Indian states have passed "anti-conversion laws." That makes it illegal for a Muslim to become a Christian! One pastor told Release he was thrown off a moving train for carrying Bibles in a rucksack. His attackers yelled, "These people are spoiling our religion!" By being thrown to a platform from a moving train, his skull was fractured, shoulder bone and ankle broken and several teeth were knocked out. However, the pastor continues to preach the Gospel. Andrew Boyd of Release International said the United States could make a difference: "The United States is so important. When the U.S. declares a country of particular concern the world sits up and takes notice. Your role really matters when it comes to religious persecution. You give out a message that the world is watching." 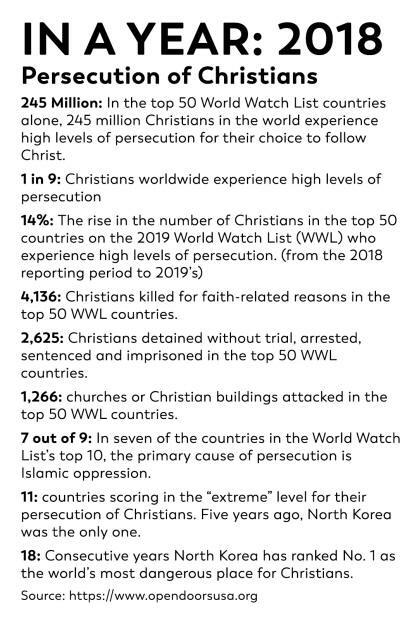 The Open Doors World Watch List reports that Christian women "often face double persecution" for their faith and gender. Its examines the 50 most difficult countries in which to be a Christian and reports that every month 255 Christians are killed, 104 are abducted, 66 churches are attacked, 160 Christians are detained without trial and imprisoned and 180 Christian women are raped, sexually harassed or forced into marriage. It estimates that 215 million Christians live in countries with "high levels of persecution." That represents one in 12 Christians worldwide. Much of this persecution comes from Islamic oppression, which is spreading in Asia (Philippines, Bangladesh, Indonesia) and Africa (Egypt, Nigeria and Somalia). It is also growing in Central Asia in such countries as Uzbekistan, Tajikistan and Kazakhstan. What can be done to reverse these trends? Consider financial support of such organizations as Open Doors and Release International. And pray for persecuted Christians daily.